This five panel exterior door features two vertical lites above the door's mid rail and three vertical panels below the door's mid rail. The two lites feature matching panes of frosted glass with a beautiful sunburst cross surrounded by scroll work. The inside of the door is shown in this photo, which makes the detail in the right-most lite difficult to see because of the backlighting. The door's three panels are without decoration or molding, allowing the door's etched glass to be the focal point. The door has an exterior knob, but not an interior knob. The latching and locking mechanism can be seen on the door's rail, adjacent to the lite. A bore hole, too low for a knob, can also be seen on the door's rail. 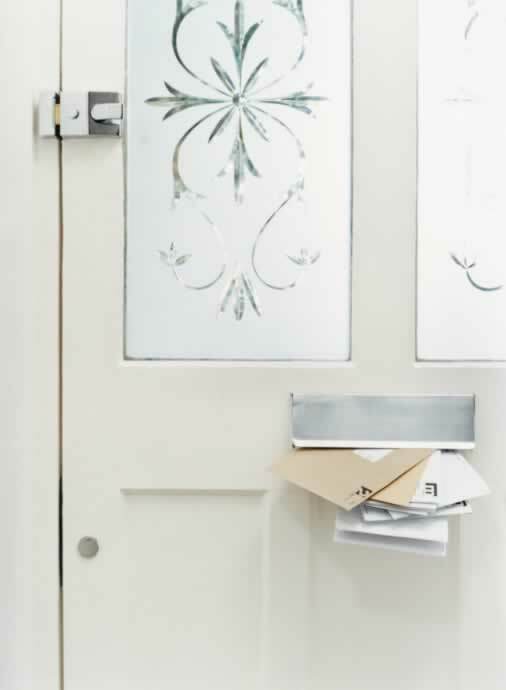 A stainless steel mail slot in the door's mid rail adds to this door's charm.